If you live in a region where it rains, having a good rain coat for your dog is an essential part of their gear attire. 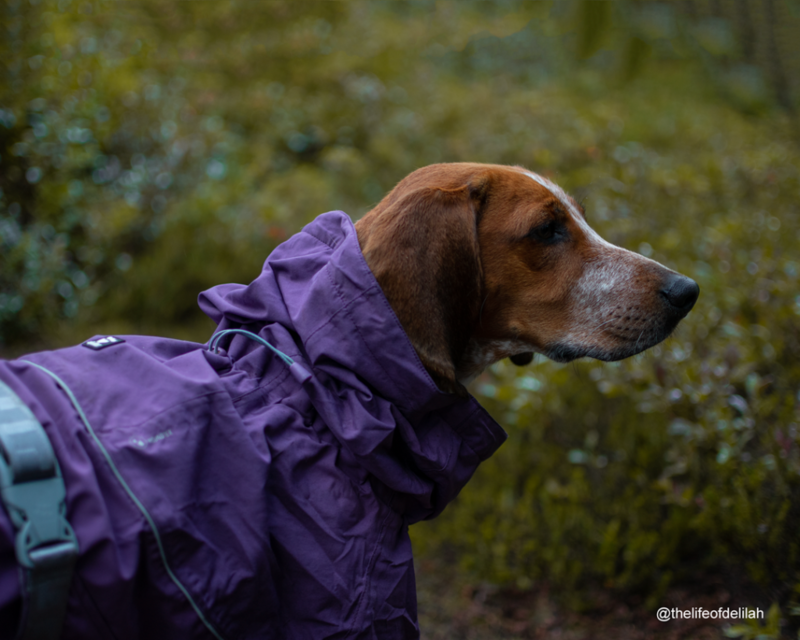 This summer Hurtta America sent their new Drizzle Coat in size 22 and color purple for Delilah to test. My first impression of the Drizzle Coat was how well constructed it is. There are number of great features on the coat that I would like to point out and some that make it unique compared to other rain wear products out there. The exterior layer is coated in Houndtex® which is a waterproof material to keep the rain and other elements out. Compared to my North Face rain jacket, the exterior material of the Drizzle Coat is much quieter during movement than mine. 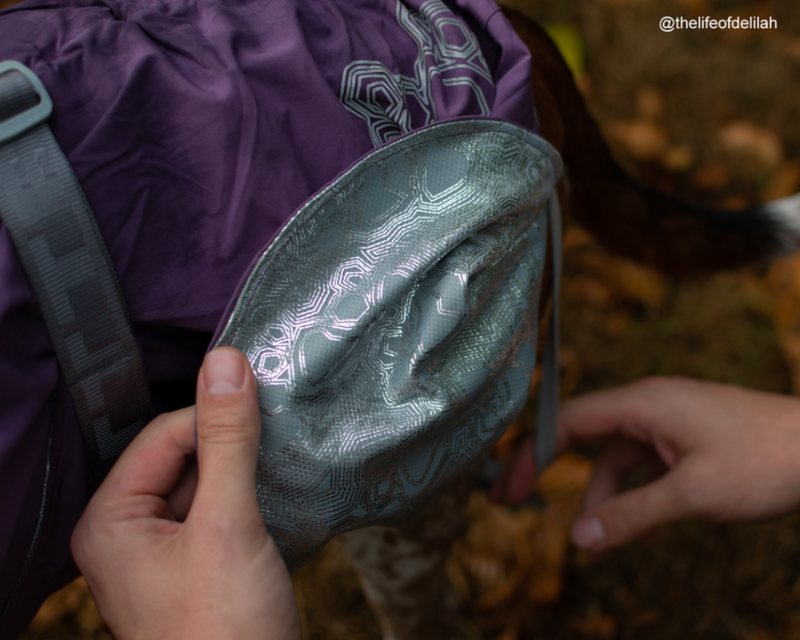 The exterior also has a unique design of 3M reflective material located near the rear of the coat and a reflective piping above your dog’s girth area. The 3M material is excellent in low-light conditions when illuminated by a light source which will increase your dog’s visibility at night. Additionally, there are three adjustable points along the coat to get the right fit. The coat offers an adjustable belt to secure it in place. 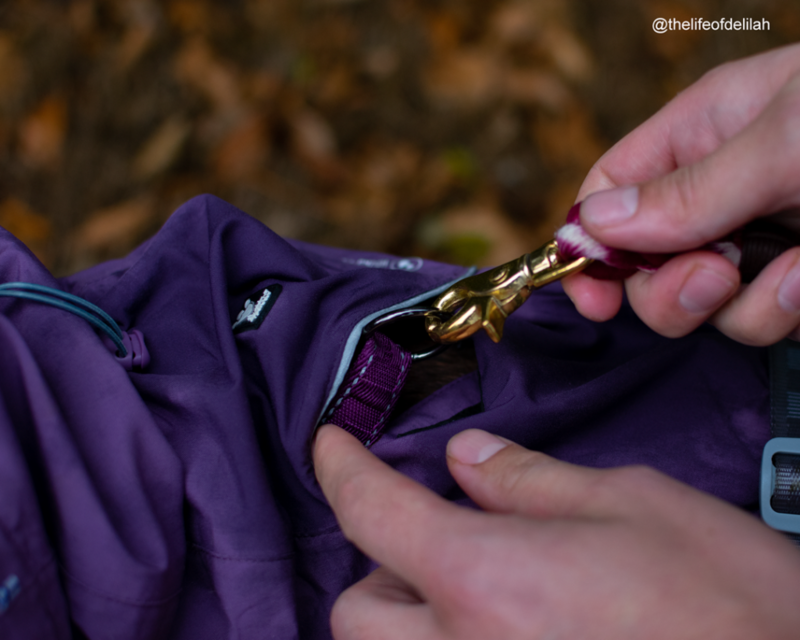 Lastly, the coat has a leash portal which is great for those who primarily use a harness for their dog. You can easily access the harness clip loop via the leash portal. Since Delilah does not wear a harness often enough, this feature was not as important to me but I do like how the leash portal can be kept shut by two secure snap clips. 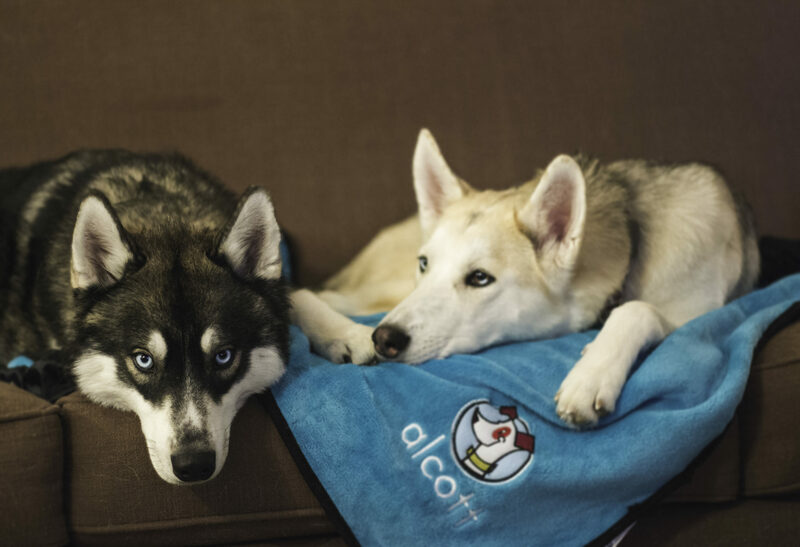 The interior layer is lined with a heat reflective material which keeps your dog’s body heat inside, so it does not escape as easily but is still breathable. Due to Delilah having short-hair, this was a nice add-on by Hurtta. However, I would not rely on this material alone to keep your dog warm if they get cold easily like Delilah. 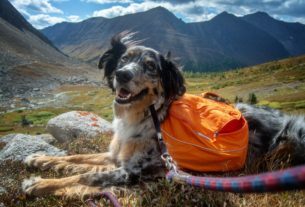 During our recent backpacking trip, I wish I had brought her Hurtta Body Warmer to add an extra layer of warmth under the coat as even though she was dry, she began to shiver after we hiked through the rain and were setting up for camp. A cool feature that I have not seen on past Hurtta products is the neck cinch with a rain trap to prevent water from entering the neck area. The coat also features two elastic rear leg straps to secure the coat closer to your dog’s body. The overall fit of the Drizzle Coat was spot on for Delilah. With three adjustable points and a belt, it was super easy to adjust for the perfect fit. The Drizzle Coat does run a bit big so if your dog is between sizes it would be best to size down, especially for smaller dogs. I also love the stretchy rear leg straps because they prevent the coat from becoming loose when Delilah is running or walking. The straps are quite loose which allows them to fit different body types and allows your dog’s legs to slip into them easily. 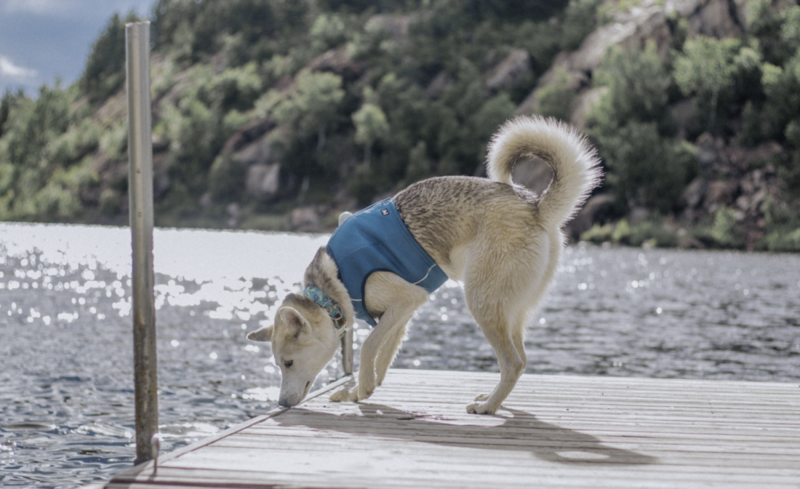 Thin framed dogs may find the leg straps are too large but this is easily remedied by tying a knot in the straps so they are at the desired length. In the long-term due to repetitive stretching of the leg straps, I have a feeling it may lose some elasticity. The quality of the Drizzle Coat is great. Upon further investigation of the stitching, design and craftsmanship, Hurtta outdid themselves with the design of the Drizzle Coat. Delilah is rough on her gear and while she was running through brush and rolling around, the coat stayed in place and protected her from the elements. When it’s time to remove the coat, you can feel the warmth on her fur from the interior reflective material at work. Not only is the quality great, it is easy to clean. Since Delilah has worn it on a number of occasions, it did get quite dirty from mud. When it was finally time to wash the coat, I hand washed it in cold water and a delicate detergent, and the dirt came right off. I did have to use an old brush to scrub the dirt off the belt strap. It’s best to air dry the coat in a well-ventilated room. To keep it from losing the waterproof coating, I recommend hand washing it as the Houndtrex® coating would eventually rub off if it is placed in a washer and dryer. 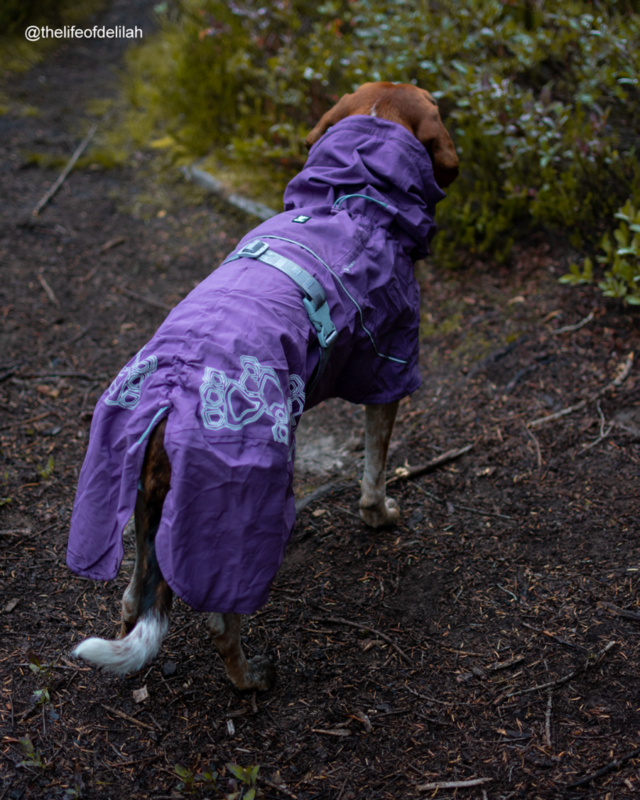 Overall, I am impressed with the quality and design of Hurtta’s Drizzle Coat and would recommend it to anyone who needs a good rain coat for their dog. It’s light enough to stuff in your daypack or backpack without significant added weight. 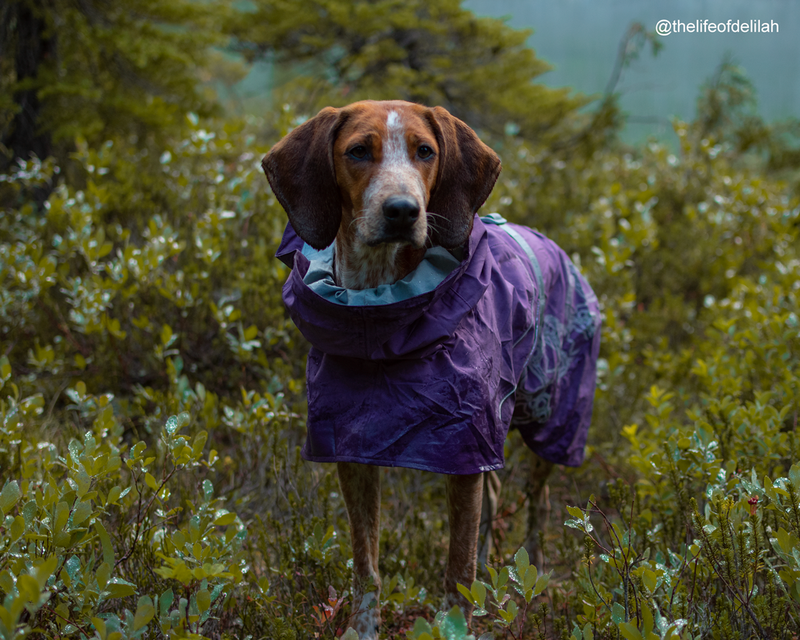 While it met our needs, if you are looking for a more coverage coat to protect your dog’s legs, I would suggest looking into either the Rain Blocker or the Downpour Suit.